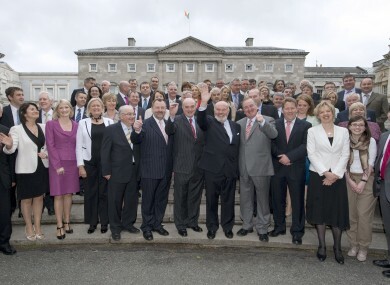 New senators take part in an official photocall for the first meeting of the 24th Seanad. A PROPOSAL THAT members of the Seanad be given a short period to reflect in silence before the daily prayer will be heard today. The proposal is from the Seanad committee on procedures and privileges and is that a short period of silent reflection would take place at the commencement of sitting every day in the Seanad just before the prayer. Senator Ivana Bacik said that she strongly welcomes the introduction of “this small change to the proceedings” at the commencement of the Order of Business in the Seanad. This change originated in a proposal to replace the prayer with a period of silence that I made to the Committee on Procedure and Privileges some months ago, but is based upon a compromise suggested by Senator Ronan Mullen. It was agreed unanimously by the Committee last week. I very much hope that the Seanad will adopt it unanimously today. If the approval is agreed, part of the wording of Standing Order 18 would change from “all Senators present shall stand and” to “all Senators present shall stand for 30 seconds of silent reflection and then”. She said the inclusion of a short period of silent reflection “provides a way for us to acknowledge the presence in the chamber and outside of those who are not of the Christian faith, who are of minority religions, or those who do not profess to be members of any religion”. It recognises that Ireland has become more pluralist, just as the inclusion of a Humanist ceremony within the Presidential Inauguration celebrations marked a similar recognition. Sen Bacik said she sees it “as an important step forward in creating a more tolerant and inclusive society”. Though Sen Bacik would personally prefer to see the prayer replaced altogether by a period of silent reflection, she believes this is the most inclusive approach. However changing the Seanad standing orders to include a period of silent reflection at least provides some recognition of the presence in Ireland of many communities from different religious and non-religious traditions, and provides a starting-point for greater inclusivity in our parliamentary procedures. Other bodies such as the Stormont Assembly and Dublin City Council have the same approach of a period of silence before prayer. Email “Seanad "should reflect in silence before daily prayer"”. Feedback on “Seanad "should reflect in silence before daily prayer"”.